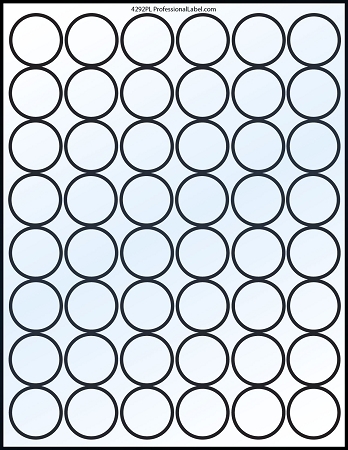 1.25" diameter circular round labels compatible with laser printers only. 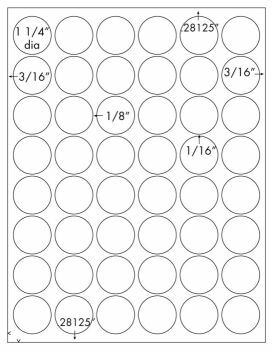 50 Sheets with 48 labels per sheet. Glossy Crystal Clear Laser Labels for use with Laser Printers only. Specify "Labels" as the paper type when printing, this will instruct your printer to generate more heat, and will bond the toner to the labels in the best way. The Round Label size is 1.25" diameter. PDF template - use with Adobe Illustrator, or Adobe Acrobat. EasyFast template 5 lines in RED. EasyFast template 5 lines in BLUE.